Though I laughed it off at the time, I’ve given that exchange a lot of thought. While my statement was true (I live in a basement condo – and I swear that it’s not nearly as dreary as it sounds), it also represents a much bigger struggle, one not easily resolved. Interestingly, positive psychology (or perhaps, rather, pop psychology) says, “If you don’t like where you are, change it. You are not a tree.” Yet in reality, change is a process more than the simple action that this platitude denotes. Oh, unhappy with something? *snaps fingers* All better! Just quit! Just move! Just cut that person out of your life! Just stop smoking, drinking, eating, gambling, cursing! Just give up carbs, fat, sugar! As “simple” as that. 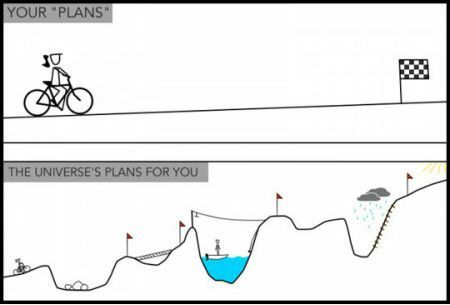 Unfortunately, that’s not been my experience of how life works. There aren’t any genies in a bottle, waiting to grant you your three wishes (and thank goodness for that, really!) No, long-term, sustainable change is a process of planning and progress…but rarely straight-on, forward motion. No, it’s often more like a two steps forward, one step back kind of shuffle, all the while dodging potholes and one-way traffic treadles. It’s easy to get tired. It’s easy to get discouraged. It’s easy to feel alone. Yet it is important to remember this: whether you can see it or not, the rainbow’s there.